The crew of the the newly rebuilt SeaQuest must deal with a hostage crisis at a UEO prison colony, where genetically engineered soldiers have risen up against their captors. A group of aliens accept Bridger's invitation to board SeaQuest and make their first contact with the human race. Seaquest gets called to a normally peaceful colony that is now experiencing mass hysteria and violence. Once Seaquest arrives, the same thing starts happening to the crew. A budding romance starts between the doctor and the captain, as well as O'Neill and Henderson. While on shore leave, Piccolo has some family troubles with his parents. Brody's Mom, who has been in cryofreeze for years, emerges and is targeted by someone trying to kill her for a crime she witnessed in the past. Dagwood is accused and convicted of murder, but it's a case of mistaken identity. The Seaquest finds an ancient helmet from the lost city of Atlantis. Once brought on board the helmet begins to have strange effects on the crew who come in contact with it. Lucas falls head over heals for a woman he meets at a bar, but it turns out she has nefarious plans to use Lucas. 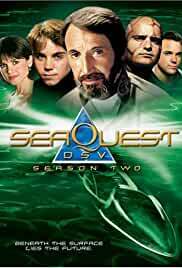 She is only using Lucas to help her father take control of the Seaquest. Dagwood and Piccolo have a strange shared dream, but the dream is only a means to an end for an evil psychic who wants to board Seaquest and steal some material. Seaquest is transported to another planet after responding to a message from Commander Scott Keller. Once there they get involved with a civil war and a possible fight to the finish. Piccolo's ex-cell-mate lures Tony into an escape plan. During the botched escape they crash into the jungle where an experimental cloaking warrior attacks them and the rescue crew sent from Seaquest.